Trees enhance a property and add a sense of permanency with their strong, upward growth. One type of tree, the Lemon Cypress (Chamaecyparis pisifera), reaches as tall as 70-feet high and attains a mature width of around 15 feet. Also known as a False Cypress, these trees grow about 12 to 18 inches annually in suitable climates and soils. The lime green color of the branches turns brighter yellow with exposure to sunlight. Enhance your yard by planting one of these delightful trees. Select a sunny spot in your yard for your cypress tree. Lemon Cypress trees flourish in climates between USDA plant hardiness zones 4 and 8. Don’t plant your Lemon Cypress close to other trees that may shade your plant or deplete the soil of important nutrients. Plant your tree in rich, well-drained soil. Add compost and peat to provide your Lemon Cypress with a loamy medium and increase the nutrient levels in your existing soil. Work these amendments into the top 12 to 18 inches of soil over your planting site. These nutrients will slowly seep into the area of your tree’s roots, encouraging healthy growth. Plant your tree in a hole twice the width of the rootball and as deep as the rootball, keeping the surface of the rootball at the same level as the existing soil. Water your Lemon Cypress regularly to ensure a moist environment near the roots. Do not allow the rootball to dry out. Give young trees a good soaking every week or two during the first season of growth. Reduce the frequency of watering as the cypress grows and matures to offer supplemental watering only when the soil becomes slightly dry. Fertilize your Lemon Cypress once each spring. Select a fertilizer designed for use on evergreen trees and apply according to the instructions on the container. 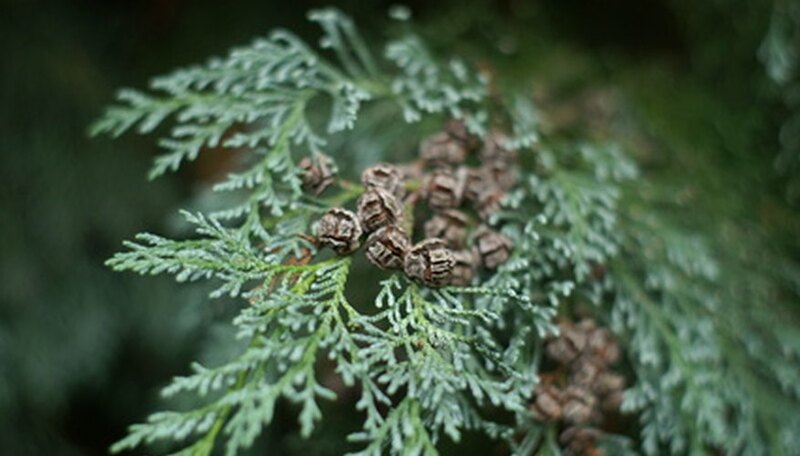 A time-release formula will continue feeding your cypress during the warm summer months. Cut dead branches off your Lemon Cypress when you notice them. Although Lemon Cypress trees do not require regular pruning, don’t allow dead growth to distract from an attractive tree. Use a pair of sharp pruning shears to nip off the damaged sections of tree throughout the year. Spread 2 inches of mulch around the base of your Lemon Cypress if you live in an arid climate with minimal amounts of rainfall.